The Chimney Sheep® is low tech and easy to use, but you need to have an idea of the size and shape of your fireplace. Have a squint into the top of the fireplace. The sheep works by being a little bit bigger than the flue so it can grip onto the sides and hold itself in place. The amount of overlap doesn’t matter too much as the felt is squashy and can fit into a range of gaps. 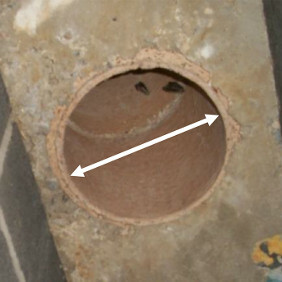 If you have a round flue, you want a round sheep that is an inch or so larger than the flue. 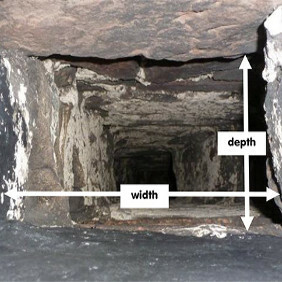 If you have any other shaped flue, measure the depth and width of the nearest narrowest part. Don’t worry if it’s an odd shape, just measure the widest bits and the wool felt will squash in to fit. While you’re in there, check the height above the fireplace. The Sheep comes with a 6” (150mm) handle and 6” (150mm) extension rod, and can be extended another 12”. More than that and the extensions get a bit of a wobble on them. It’s easier to fit a large sheep lower down than a small sheep high up. 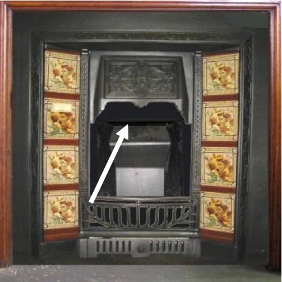 It’s very important that the handle is long enough – firstly because it’s a lot easier to put in, and secondly the end of the handle must show in the fireplace so that no-one inadvertently lights a fire with the Sheep in place. If you have a square, oblong, D-shaped, trapezium shaped or similar use the sizing chart below to help you. Remember that a round sheep will squash into a trapezium or oblong hole. 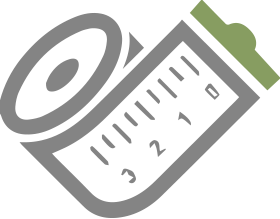 If you have a chimney flue that doesn’t match any of the sizes given you may need to have one made specially – let us know your chimney dimensions and we can give you a quote for getting a bespoke one made. If it’s between two sizes it will be between those two prices. Just push the wool head into the narrow part of the flue. You may need to tug it down gently to ensure a good fit. That’s it. When you want to remove it, pull gently in case there is any debris collected on it that has fallen down the chimney. Tap any loose soot into the fireplace, and put it in a bag. The sheep wants to go in the nearest, lowest opening. If you’ve got a fire surround don’t try posting it through into the main chimney! The Sheep will inevitably get sooty and can be kept in a bag or in the log basket / coal bucket when it is not in use. If you want to wash it, unscrew the handle, pull off the clamp and clean it on a wool cycle and air dry it. Do not tumble dry it as it may shrink. If your chimney is brick or stone on the inside it might start to get a bit frayed around the edges after frequent use. Any stray bits of wool can be trimmed off with a pair of scissors. If it is left in the chimney for a long time it can get a bit squashed looking. 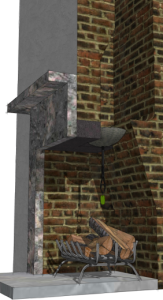 This doesn’t really matter as it is taking on the shape of your flue, but you can get it back into shape by taking the clamp section out and reversing it so it squashes in the other direction.